In his first American film, Fritz Lang immerses his audience in a world that seems to offer hope and, for the patient, a sense of joy. But clouds form, and before our eyes gathers a storm of oppression and darkness, of identities wrenched away by invisible forces. With his trip across the Atlantic in 1934, Lang didn’t leave Nazi Germany behind so much as allow himself to translate the horrors of his homeland into a new language, an American cinematic tongue that revealed an evil inherent in his new home, an evil born of mob rule, misunderstanding and a fragile moral and social order. Spencer Tracy as Joe Wilson makes the transition from good to evil as surely, if not as suddenly, as he does in Victor Fleming’s Dr. Jekyll and Mr. Hyde (1941), minus the make-up and special effects. Joe is not alone in Fury. People who seem to be admirable one minute morph into something inscrutable the next, and finally into something utterly detestable. Lang brought with him a reputation as one of Germany’s premiere filmmakers. Hitler’s propaganda minister, Joseph Goebbels, supposedly wanted him to run Germany’s film industry. But Lang would have none of it. Only two projects separate Fury from one of his best known films, M (1931), which is as much about a child murderer as it is about clashing social systems amid a larger failure of the good in people to coexist with an evil that often lies just beneath the surface. More than social realism links these two pictures: M was Lang’s first sound film; Fury his first film in Hollywood. Each shows a director impatient to reveal what other filmmakers have shied from. Fury is the story of a man whose life (and the lives of those around him) is riven by revenge. Joe Wilson and Katherine Grant (Sylvia Sidney) are an average American couple, planning their lives together. They stop at a furniture store window where a bedroom suite is on display – two twin beds, of course – and they pledge their love to each other. But tension peeks though the veneer of a quiet life together. Joe is poor and Katherine has found a job in another town and will leave that night. Joe can be reunited with her only after he saves up enough money. He is hardworking but bitter that his brother, Charlie (Frank Albertson) is doing well working for someone with a shady background. Joe’s rectitude reinforces his anger (and jealousy) at Charlie and plants a seed for a darker element that emerges with frightening potency later in the film. The second act begins as Joe, finally on his way to see Katherine in her new home in Strand after some success as a filling station owner, is stopped by a laughable sheriff’s deputy played by the gifted character actor Walter Brennan. A kidnapping has occurred, and Joe is taken to the sheriff for questioning. Thus, Lang begins his take on the theme of mistaken identity that Hitchcock mined so fruitfully in The Lodger (1926), Saboteur (1942), The Wrong Man (1956) and North by Northwest (1959). Gossip about Joe’s capture spreads like a brushfire in the wind. A mob storms the jail where Joe is held, sets it on fire and blows it up with dynamite as Joe peers frantically through the bars of his cell. 22 townspeople are accused of murder, people who look just like Joe – people who look just like us. Peter Bogdanovich discusses such “mobs” in Who the Devil Made It, an engaging collection of interviews with 16 filmmakers. In a preface to his 1965 interview with Lang, Bogdanovich might as well be describing the mob from Fury in this passage about While the City Sleeps (1956): “The monsters here, unlike those in the German sagas, are not disfigured supercriminals plotting from subterranean cellars, but well-dressed citizens from the mainstream of life.” (1) In Fury, the 22, some of whom were nothing more than gossip mongers, have become entangled in their collective frailties, one moment reckless enough to foment half-truths and lies after learning about the capture of the “kidnapper”, the next moment desperate enough to express their misguided passions by storming the jail and destroying it, knowing a possibly innocent man is inside. If only Katherine could expiate their sins. “A mob doesn’t think. It hasn’t got time to think”, she says. Strand, the town where Joe is imprisoned, is quintessentially American. Scenes in a bar, a barbershop, a grocery store and a diner suggest the kind of normalcy Hitchcock portrays in Shadow of a Doubt (1943). But in both towns another world exists, the world Lang himself depicted so brutally in M, a world “of shadows and night; ominous, haunted, filled with foreboding and violence, anxiety and death” (2). Joe travels to this town filled with happiness at seeing his girlfriend after a year. He arrives a prisoner of misunderstanding and false assumptions, and is smothered by frenzy. Even crusty Sheriff Hummel (the marvelous character actor Edward Ellis) maintains that Wilson may be guilty or he may not. It is one of the mob who declares to one of her catty friends, “In this country people don’t land in jail unless they’re guilty”. In America in the Movies, Michael Wood explores the subject of lynching, a particularly sinister practice in (white) America’s long history of its relationship with blacks and others it considers different. At one point in Fury, this history of lynching is given historical weight. The district attorney, played with wooden histrionics by Walter Abel, says that in the last 49 years, mobs have lynched 6010 human beings “in this proud land of ours… a lynching about every three days”. He tells the court that only 765 suspects were ever brought to trial. He blames the cult of silence that forms around lynch mobs and declares that the silent are as guilty as the murderers. Is the lynched man ever guilty? Fury throws an especially wide curveball at this question, which Wood addresses by suggesting that even if the lynched man isn’t always innocent, “His innocence is what makes his persecution so terrible” (3). The 22 men and women on trial in Fury aren’t really guilty even though the jury finds them so. Wood introduces William Wellman’s morality tale The Ox-Bow Incident (1943) in the following manner: “The man they were supposed to have killed is still alive, and this heavy irony seems to imply not so much that we ought not to lynch people as that we ought to check our facts out properly before we do.” (4) Lynching is all right, Wood says, as long as the man is guilty – or in the case of the thousands of lynchings that have occurred in America, as long as the man is thought to be guilty. Wood penetrates even more deeply into the American conscience: “What these movie stories articulate, I think, is a secret affinity with the lynchers that most of us would probably prefer to deny.” (5) Lang not only forces us to identify with Joe Wilson’s potential executioners but with Wilson’s own twisted innocence. Lang’s moral imperative gives way to a trickle of Hollywood treacle with a kiss shared by Joe and Katherine in the last scene that bookends their kiss at the beginning, and that is meant to illustrate their love for each other. Lang has said he hated the kiss, coming on the heels of Joe’s eloquent speech proclaiming his desire for another chance, a chance that would lead to redemption. Lang describes the ending as “coy” (6). What Lang may not have realised is that his audience, primed throughout the picture for Joe and Katherine to end up in each other’s arms, would have considered lynching the director if he’d failed to seal his first Hollywood melodrama with a standard Hollywood embrace and kiss. Producer Joseph L. Mankiewicz made sure Lang worked with the best for his Hollywood debut. Lang was given the great cinematographer Joseph Ruttenberg, who won Oscars for The Great Waltz (1938), Mrs. Miniver (1942), Somebody Up There Likes Me (1956) and Gigi (1958). For the most part, Ruttenberg’s camerawork serves Lang’s documentary purpose and does not call attention to itself. But when it does, it fulfills Lang’s vision of emphasising the enormity of the events that threaten Joe’s life. His daringly canted close-ups capture the horror on the faces of Katherine, when she sees Joe behind flames in his cell, and others in the crowd witnessing their barbaric communal wrong. Elsewhere he captures simmering images of shadows of rain on a wall and brilliantly frames Joe’s shadow-draped return from the dead. In a poetically subtle moment, as the town’s citizens listen to the trial on the radio, a woman of means focuses on a radio whose silvery side panel reflects the image of her husband tying his necktie. Fury is a triumph. 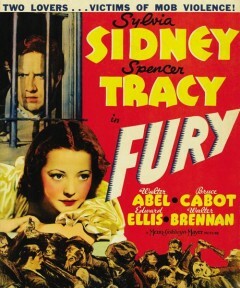 Writing in The New York Times on 6 June 1936, Frank S. Nugent declared Fury “the finest original drama the screen has provided this year” (7). It is the flip-side – a Kodak negative – of M, whose child murderer has much in common with Joe Wilson. They are both victims. Joe, a “good” man, is the victim of a mob mentality driven by an impulse as evil as the one that propels M’s Franz Beckert (Peter Lorre), a “bad” man, to his next victim. Joe’s “killers” end up in a real courtroom with a real lawyer to defend them; Beckert finds himself in an underworld courtroom where he is both accused and defended by criminals, one of whom suggests he be turned over to the police. Even the mobs are opposites. In Fury, the mob that turns on one of its own comprises solid citizens who probably go to church on Sunday. In M, the mob and Beckert also come from the same stock, albeit the one that lives with the rats under the streets of Berlin. As Morris Dickstein writes, “The murderer among us also becomes the murderer inside us, the gruesome power of instinct, obsession and aggression against which we have little real defense” (8). If Lang is warning us that the next turn in the road can bring ruin to the best planned lives, he is also reminding us that the evil we detest in our next-door neighbor or the guy who sits in the next office stares back at us when we look in the mirror. Peter Bogdanovich, Who the Devil Made It, Alfred A. Knopf, New York, 1997, p. 174. Michael Wood, America in the Movies, Columbia University Press, New York, 1989, p. 136. Nugent cited in Robert E. Kapsis, Hitchcock: The Making of a Reputation, University of Chicago Press, Chicago, p. 226. Jay Carr (ed. ), The A List: The National Society of Film Critics’ 100 Essential Films, Da Capo Press, Cambridge, Mass., 2002, p. 175.